A Grand Marquis hot rod? 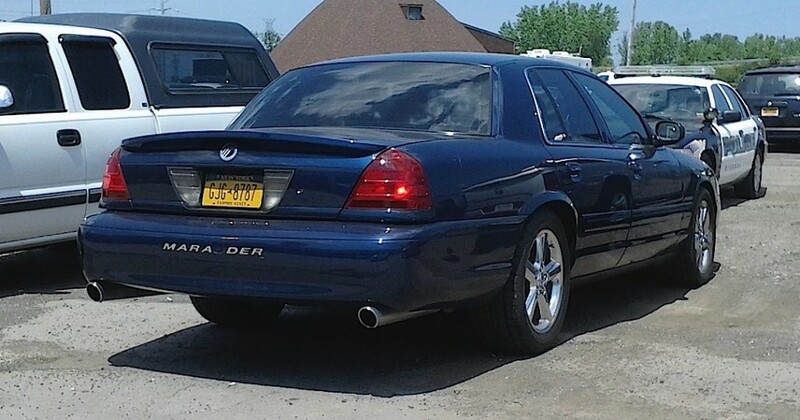 Well, not exactly, but this 2003 Mercury Marauder curiously was based on the GM rather than Ford’s Crown Vic. Maybe they were trying for an image change by offering this — yes, hot rod, in a showroom usually filled with pensioned tire-kickers. Under the hood of the Marauder lurked a 32-valve 302-hp V-8, while the interior featured real gauges, and two rather straight exhaust pipes poked their heads out from beneath the rear bumper. Was it a success? Well, it didn’t hurt anything, but Mercury still faded away into oblivion in 2011. You can read Car and Driver’s drive report on the Marauder right here. This dark blue example can be seen regularly in Niagara Falls. Jim Corbran, RRofWNY …and check out our Facebook page: Un-American Classic Cars The post RealRides of WNY appeared first on Buffalo Cars.